Liva Mishra from Ahmadabad, B.A Graduate. RECRUITMENT AND SELE.. POLICY & SOP FORMULA.. INDUCTION & JOINING .. TRAINING AND DEVELOP.. EMPLOYEE RELATION & .. LEAVE & ATTENDANCE M.. PERFORMANCE APPRAISA..
are one of expert skill area's of Liva Mishra . 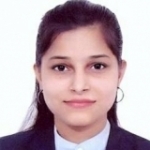 Liva Mishra is working in Human Resources industry.